Dear blog, here’s A.S long delayed trip report back in Wanaka, NZ. It may be short and hopefully, it is sweet, too. 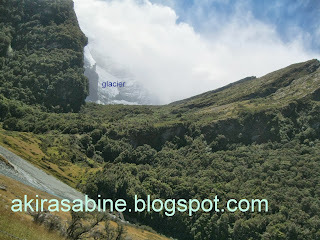 The objective was to get a closer look at the glacier. It wasn’t a pleasant ride to get to the starting point of the National Park. Imagine a bumpy ride for 10 km maneuvering narrow stony unpaved road but the landscape and encounter with deers and sheep was superb. Followed the track but glacier didn’t seem to get any closer after 1 hour’s walk. View was however picturesque and there were sheep grazing on the slopes. Some streams crossing required without any bridges. Met a friend again who stayed at the same hostel in Hokitika a week earlier. Joined him to Mount Ithmus overlooking Lake Hawea. Awesome hike, awesome solitary getaway, awesome landscape. If you wonder about the sound, pure “…..”. Blissful, absolutely blissful. So peaceful that A.S and mate stole a nap for 30 minutes. That evening, A.S and mate separated and A.S continued her journey to yet another spectacular city, Queenstown. OUCH. nah, not painful but tedious job. Mate busy sharing his photos.